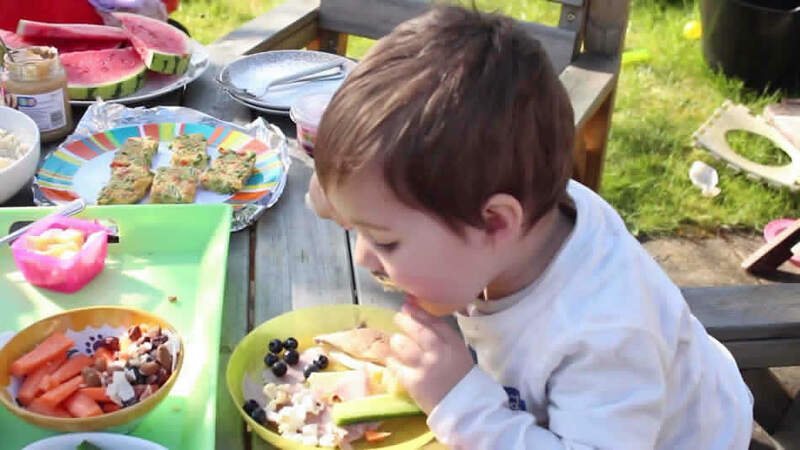 If you have fussy eaters in your family then enjoying mealtimes on holiday can be a challenge. 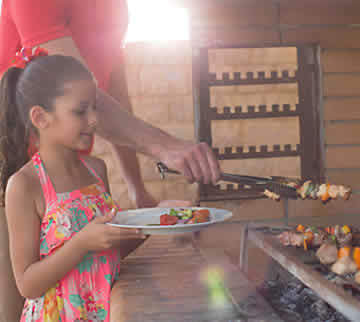 While staying in a villa you benefit from more catering freedom and flexibility than on most other holidays, but to make the experience even easier we’ve asked the author of My Fussy Eater blog, Ciara, to tell us her top tips for feeding children while on holiday. From encouraging little ones to try new things to keeping a good routine, our guide should make dining together as a family a pleasant holiday experience rather than a chore. Feeding children can be difficult enough, but when you take them out of their usual routine and into a new environment, all of the hard work you have done to create good healthy eating habits can go straight out of the window. 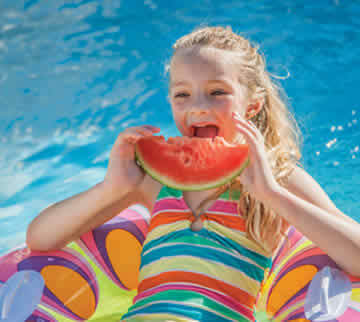 To help you make the most of your time away, here are top tips for feeding children on holiday. Most children are creatures of habit and they enjoy eating the same kind of foods at the same sort of times every day. Have some fun in the lead up to your holiday by preparing some local dishes at home. You may then be surprised when it comes to your holiday that the children are actually excited to try the local cuisine. Remember to pack any must have favourites. If your child eats peanut butter on toast every single day for breakfast, then on holiday is not the time to wean them off it. Take a couple of their most favourite, non-perishable, food items to keep something familiar and comforting about eating whilst on holiday. You may then find that for the rest of the day they are more open to trying new things. As adults our mealtimes and eating routines often change on holiday. Whilst it’s lovely to adopt a more European way of eating, including eating late in the evening, remember that children will get tired, hungry and grumpy at the same times every day. So try to stick (roughly) to their usual eating schedule, and if necessary feed them their evening meal a little earlier than you have yours. 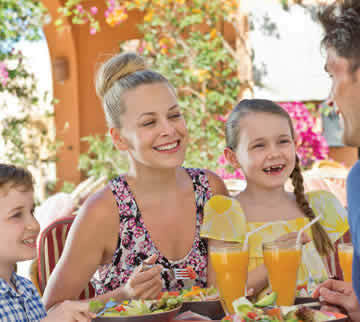 Self-catering usually offers the most flexibility when it comes to feeding kids abroad. As well as meals, it makes it super simple to whip up snacks for your hungry brood. Giant slices of watermelon in Lanzarote make a really great hydrating snack for kids, and delicious freshly picked olives in Cyprus make a great nibble just before dinner. If you are heading out for the day, to the beach or on an activity, don’t forget to pack lots of snacks for the family. Healthy snacks such as popcorn, dried fruit, nuts, cheese, and of course fresh fruit and vegetables are all readily available in supermarkets abroad and will be a much healthier and cheaper choice than anything sold in a beachside café or at a water park. If you do eat out at a restaurant then don’t feel limited by the children’s menu. Many starters from the regular menu will be a perfect size for children, or just ask the restaurant to create half a portion of a regular adult meal. Above all, relax, have fun and don’t force the food issue too much. Happy parents equal happy kids, so lead by example and embrace the local cuisine yourself, and your family’s fussy eaters may surprise you. And if you're ready for a little mealtime inspiration, check out our guide to Spanish dishes.